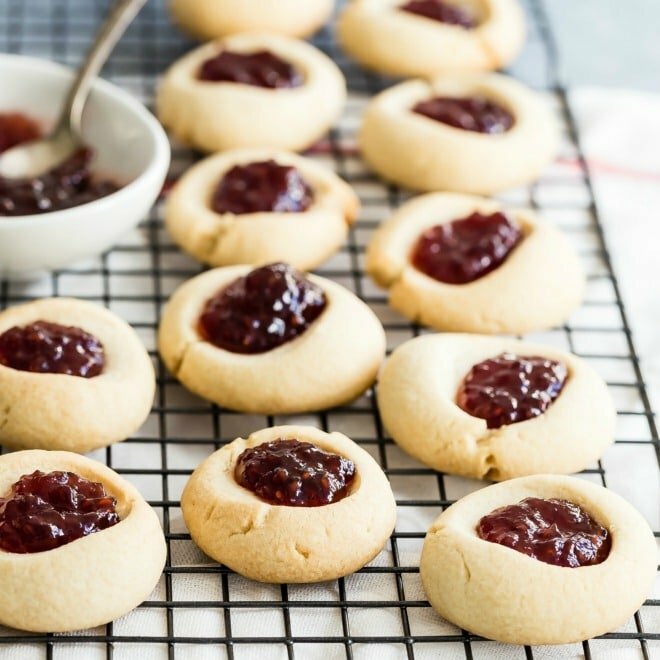 My mom’s classic Spritz cookies recipe is the only one you need! These tiny cookies are crunchy, sweet, and perfect with a sprinkle of colored sugar. Shortened from the German word “Spritzgebäck,” Spritz cookies are the ones I remember mostly fondly from my childhood. 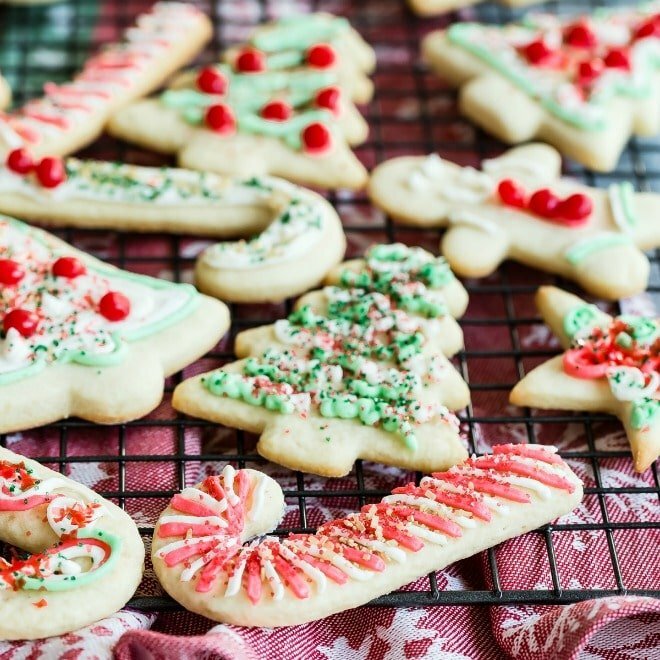 With Christmas music playing in the background, my mom would operate the cookie press and all four of us kids would gather around, elbowing each other, to help decorate them with colored sugar and candies. 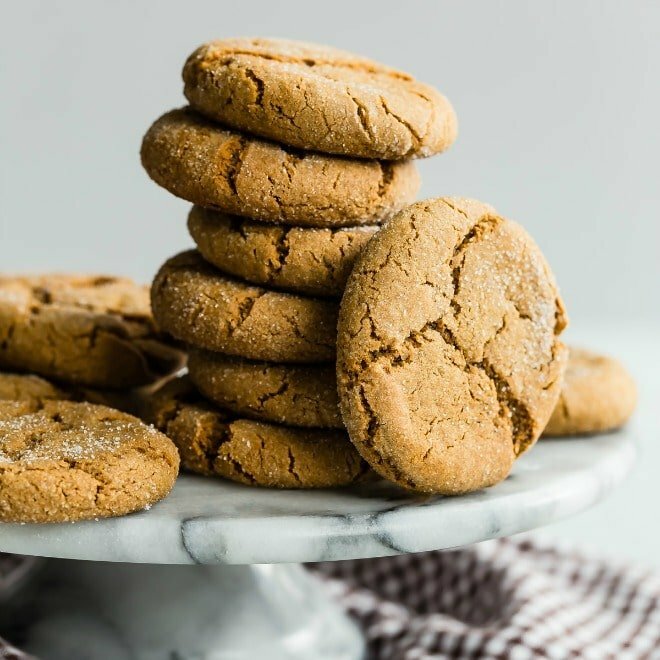 I definitely recommend a standing mixer or hand-held electric mixer for this recipe so the shortening is fully incorporated into the cookie dough. Without one, mixing the dough by hand, it might wind up too tough or crumbly (if this happens, just add more shortening). However, you can avoid the problem entirely with the help of a mixer. There are a lot of cookie presses on Amazon these days, but I wanted the one my mom has. I found a Mirro cookie press, circa 1950, on eBay for about $18.00 and it’s in perfect condition. When you’re shopping for a Spritz press, I recommend buying one that is metal if you can. The modern-day plastic ones don’t last as long. Your grandchildren won’t be selling your plastic cookie press on eBay in 50 years! I like to use colored sugar and tiny candies on my Spritz. Part of the joy and ease of them is you don’t have to make frosting! But you certainly can if you want to! 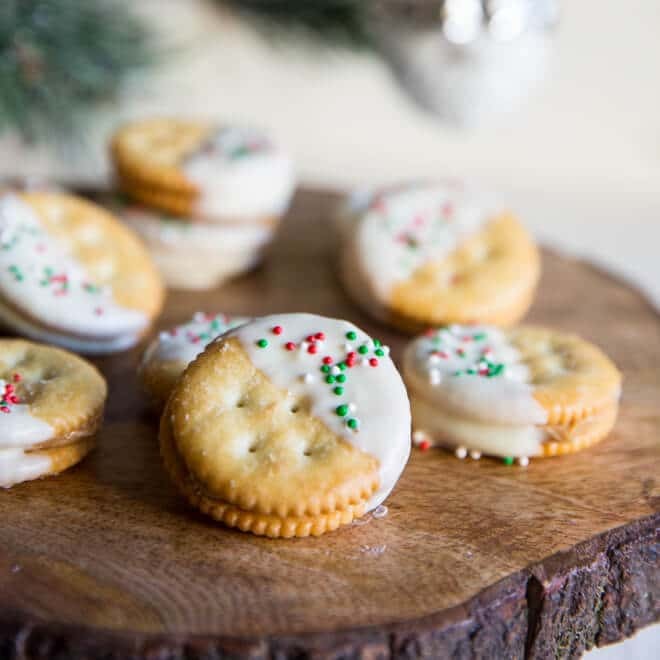 Save these Spritz Cookies to your “Cookies” Pinterest board! 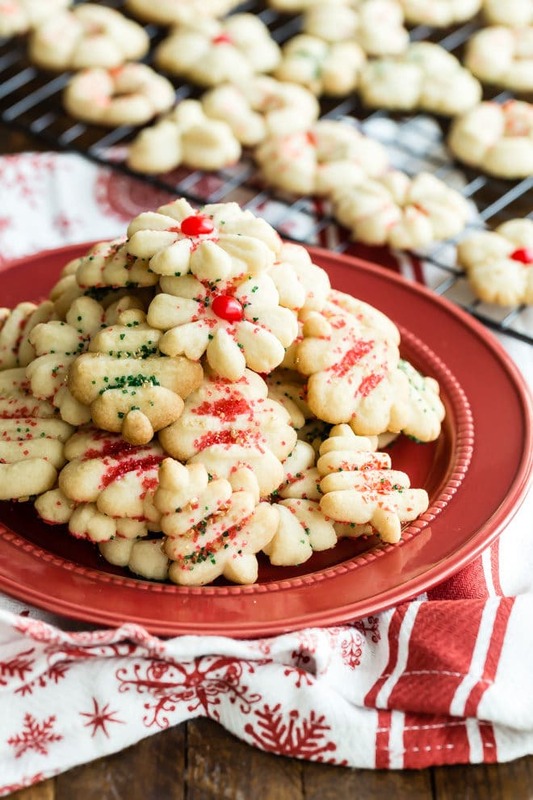 My mom's classic Spritz cookies recipe is the only one you need! These tiny cookies are crunchy, sweet, and perfect with a sprinkle of colored sugar. Preheat oven to 375 degrees. 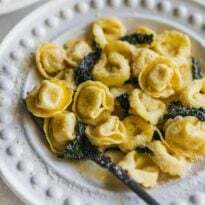 In a large bowl, sift or vigorously whisk together flour, baking powder, and salt. Set aside. In a standing mixer with the paddle attachment at medium speed, or with an electric mixer, beat shortening and sugar. Add egg and almond extract and beat well. Reduce speed to low and gradually add flour mixture until just combined. Fill cookie press with dough according to the manufacturer's instructions. Press cookies out direct on to ungreased baking sheets. Piped dough that doesn't look neat can be scraped off again and re-piped. If the dough becomes too sticky, refrigerate for 10 minutes. Sprinkle with colored sugar or decorate with candies as desired. Bake until the edges are lightly golden and set, about 10 to 12 minutes. Cool 2 minutes on baking sheet before transferring to wire racks to cool completely. Adapted from "Mirro Cooky and Pastry" brochure (came with my mom's cookie press). How are they buttery, without butter? I’ve never seen a spritz recipe with shortening in it…. I too purchased an old mirro press on eBay, it is the only one that really works well with spritz dough. Hi Juli, they just are! Did you use the Spritz recipe that came with the Mirro press? That’s what this is. It’s straight out of that battered 1950’s cookbook. 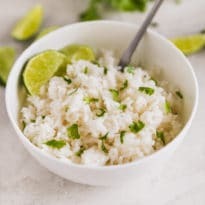 It’s the one my mom always made and it’s the best… at least in my opinion. No butter. 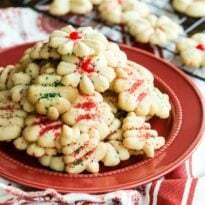 This is your comment on your recipe: My mom’s classic Spritz cookies recipe is the only one you need! 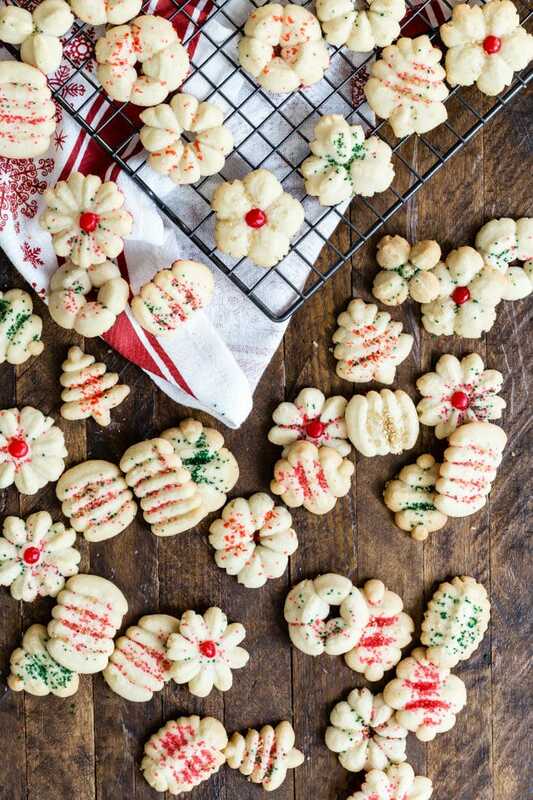 These tiny cookies are crunchy, buttery, and perfect with a sprinkle of colored sugar. Why do you say they are ‘buttery’ if there is no butter in the recipe.? My recipe uses butter and they are delicious also. Hey there, so “buttery” in this context refers to the flavor, not the ingredients, but you aren’t the first one to be concerned by my description. Shortening also produces a buttery flavor, at least in my opinion, especially in these cookies and in pie crust. However. I am going to change it so I don’t describe the cookies as buttery anymore. I’m so sorry about that! Thanks for letting me know. Were actually “buttery” without the butter! Pretty impressive. 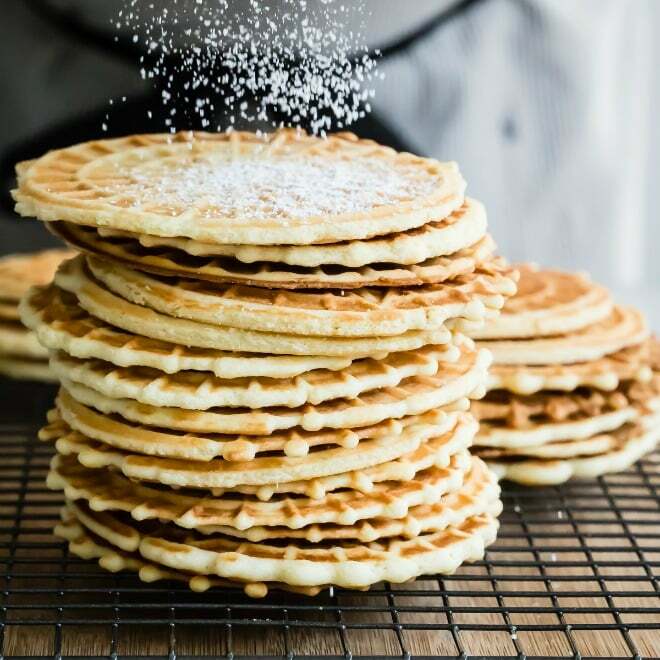 My secret pleasure is having these in the morning with a cup of coffee!